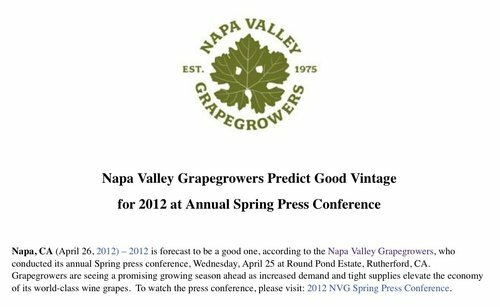 The Gray Report: Napa Valley Grapegrowers issue earliest harvest report ever: 2012 is great! Napa Valley Grapegrowers issue earliest harvest report ever: 2012 is great! I got this press release yesterday. In other news, the San Francisco 49ers announced a ticker-tape parade for their 2013 Super Bowl victory! lol! You're too funny, and correct, we've still got to get through frost season - a few more weeks - and summer heat. Any day now NVG will begin Tweeting that all the whites in the valley have been picked and winemakers are delighted with how the reds are coming. My frost alarm went off yesterday morning. Yes, it was 7:30 a.m. but watch your back. This morning I got an email at 6:30 a.m. from a vineyard manager asking if they could take water from the fill station on my vineyard because their well had run dry. It's a long long way till harvest 2012. Thanks for being a sarcastic realist Gray.